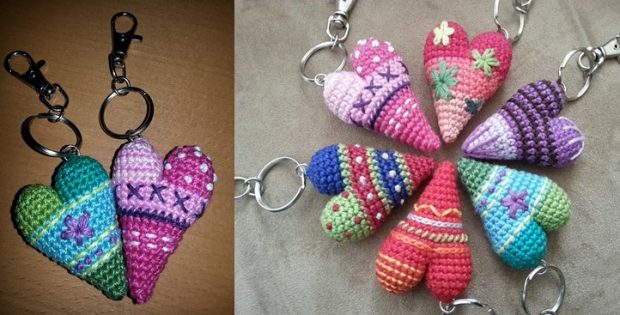 Share some love with these crocheted heart key rings. They are easy and fun to make. This crochet project is great for confident beginners or even beginner crocheters who want to improve their crochet prowess. The FREE pattern is available in a .pdf format document and it gives the complete steps in making the key ring. There are different designs shown in the pattern but the details to make them were not included. This will actually give you free rein on how you want to decorate these crocheted key rings. Kerstin Arnold made the design for this adorable 3D crochet project. These will make very nice gifts for friends and family . You can download the FREE pattern for these cute crocheted key rings and start working on this cheerful project today. The FREE pattern is available in German and English. Featured image(s): Kerstin Arnold – thank you!